The sofa bed is the ideal to have an extra bed in a studio apartment, a holiday house or a small apartment. The sofa bed is the ideal furniture in special situations, such as when you have to deal with a studio apartment, a holiday house or a small apartment, where it is necessary to have one more bed only when you need it. The first requirement which is required of this furniture is to be practical, it must be simple and not laborious, together with a security mechanisms. All this, of course, should not come at the expense of the aesthetic because, beyond its use as a bed at night, the sofa is especially a piece of forniture in the living room, where you spend most of the time and receive guests. Great attention should thus be paid to the quality of materials, choice of design, harmonizing with the decor of the entire house. Among the models on the market, there are some differences of types and materials of manufacture. 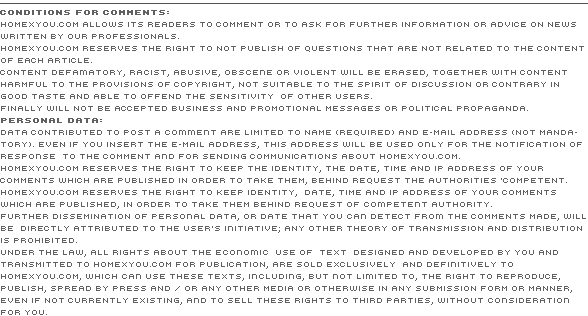 One of these differences is constituted by the opening mechanisms. With the sliding mechanism upwards, the sofa is opened by pulling and lifting the back. So what will become the bottom parte of the bed, which is composed both by the seat and the back. The front sliding opening is operated by a mechanism that is operated by being in front of the couch and pulling toward the floor session. The aerial front opening, however, is not expected to slide the seat surface, but the backrest, which is lifted up to the total extension. The nets can be slatted or welded, while the mattress, covered with a quilt, has a thickness varying between 12 and 14 cm. The sofa bed with horizontal opening, with the second bed, is one of the most common mechanisms and is frequently used in kids' rooms. A bed is placed under the seat surface and is removed by sliding it on wheels. A mechanism then allows you to raise the height of the other. There is also a system, rarely used, which is constituted by a vertical slide mechanism which, once opened, produces a bunk bed. The length is the standard for a single bed (between 190 and 200 cm), the net has wooden slats and the mattress is usually around 15 cm thick. In models with folding mattress, covered linings or quilts, is the backrest and seat of the couch. The opening system is one of the most simple, in fact this is a lever that allows the opening and complete the transformation into bed by pressing on the backrest which opens the sofa as a book. The nets are wooden slats and the mattress can have springs. When purchasing a sofa bed, remember to try to open and verify that the mechanism is as simple as possible and requires a limited number of operations. Berto Salotti offers a range of first floor for technology and quality of materials used in construction, for the large number of content models, diversified by type, style and sizes, the wide range of upholstery fabric and leather, always selected in favor of quality, with attention to stylistic variations and color, satisfying the demands of the public aware and demanding. The sofa bed Easy was born in Berto laboratory to give pleasant moments of relax during the day and total comfort at night. It has wooden frame, upholstered seat cushions and back cushions in polyurethane foam, pillow compartment and contains a net. The legs are made in PVC. It is equipped with a foam mattress of 14 cm thickness and is fully removable and customizable. 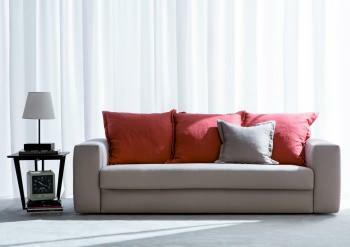 PHILADELPHIA is new, within the broad collection of sofas beds and poufs, designed by Berto Salotti. It is a very comfortable sofa, characterized by the soft cushions of the seat backrests padded with goose feathers and the size of the deep and comfortable seat. 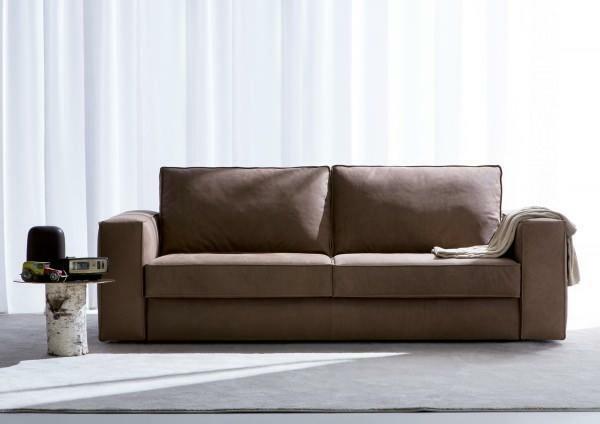 Philadelphia is made with care and attention typical of high-level craftsmanship, distinctive value of all production by Berto Salotti Manufacturers of Comfort. The structure of Philadelphia, characterized by a modern and essential line, has been designed around the welded net, 5-year warranty. The mattress is thick, fourteen cm in versions anatomical, removable polyurethane foam or orthopedic spring. Philadelphia is a real sofa that contains a real bed. Two features impeccable offered in a unique design solution, to magnifically resolve the living space. 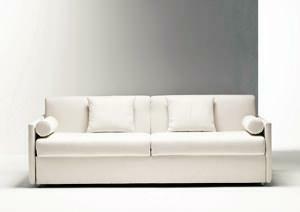 DUE is a sofa bed of essential form, important in size, measuring 222 cm to a depth of 95 cm. The backrest height is 90 centimeters. 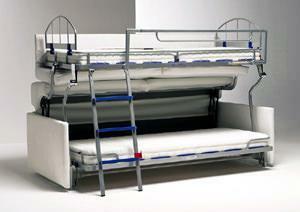 It contains the amazing utility of a bunk bed, and then offers two single bunk beds. It's the perfect solution for hosting friends, for the kids and younger children, thanks to the patented safety systems, which is fitted. 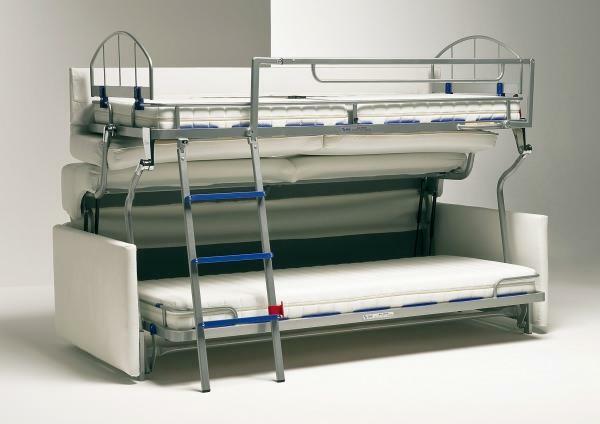 The sophisticated and revolutionary patented mechanism at the international level, in fact, allows you to get two bunk beds, combined with an easy opening that acts simultaneously on the tip of the upper bed and slip on the bed below. The release handle allows an easy opening, combined for the two beds. The retractable ladder is built and its movement allows the side wall of security to rise automatically. The upper bed is provided with protective headboards. The sofa bed Due is equipped with an innovative, anti-locking with double locking safety. The lock block with removable key prevents accidental closure of the net. The sofa bed Due is the result of an innovative project that includes the study of structure in high strength steel, painted with epoxy powders in gray, the bed slats in beech wood 20 cm wide, which are housed in special supports in blue color, with chromed aluminum joints. Support an upper mattress 80 cm x 190 cm and below 75 cm x 188. Both mattresses are 12 cm thick. There are many varieties of fabric and many colors available for the removable cover. Also available in custom pillows, sheets and parures measure. Two cozy and comfortable sofa is designed for the young space. It 's the ideal solution to be provided with two more beds, adequate to needs of an optimal rest, also to be used every day. Passepartout is a sofa bed with wooden frame covered with polyurethane foam. The padding of the seat cushions in polyurethane foam of different densities, while the back cushions are upholstered in piumafill (feather and snowflakes polyester) lining with polyester/ cotton. This sofa has a slatted frame with elastic straps and can be upholstered in leather, faux leather or fabric cover. 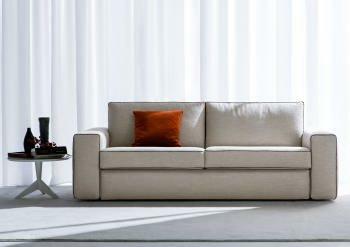 Berto Salotti Manufacturers Comfort offers its customers a real collection of sofas and ottoman bed.